Different theories about the existence or busting the existence of ghosts may vary but there are several known toys or rather dolls which are known to be possessed. Some of them have been brought alive by pop culture through series or movies, but now a 116-year-old doll to be a haunted toy even left ghostbusters in shock. 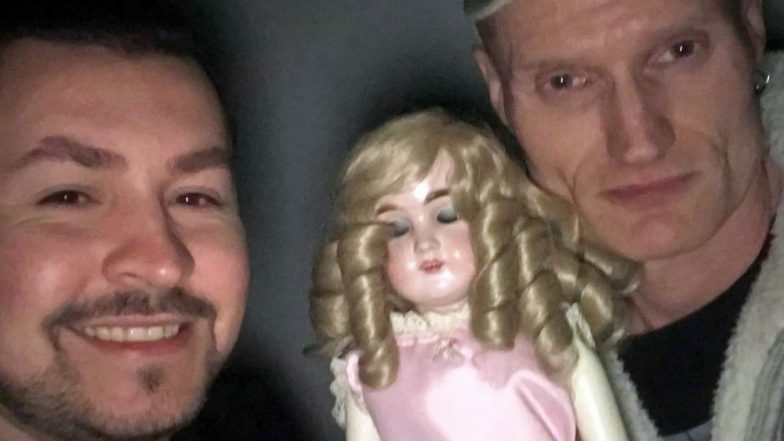 Two ghost hunters took a selfie with a supposed haunted doll named Janet. The doll appeared to blink in the selfie, but the shocking part being, it has no eyes or eyelids. The chilling activity took place in an abandoned building, known as 'The Village of the Damned', in Mansfield, Nottinghamshire. Australian Mother Claims Her Daughter’s Luvabella Doll Turned into a Demon from a Horror Movie. Several people have reported feeling dizzy and get headaches in the presence of this doll. Some of them have even heard weird noises and heard footsteps around so two investigators decided to look into it and were clearly left horrified. Paranormal investigators Craig Jones and Matt Wood brought the doll with them to investigate it. And when they took a picture with it, the doll had its eyes closed, with eyeshadow and mascara on. Possessed Doll Attacked Boyfriend Because It Was Jealous, Claims a Peruvian Woman. Craig an enthusiast of investigating into dolls thought of getting snapped with the latest piece. But once they saw the final picture they were shocked, because they realised the doll has no eyes or eyelids. Craig was quoted to Mirror UK, "We took a picture with Janet, and as I looked at the picture it looked like her eyes were closed. But then I remembered that she doesn't have any eyes or eyelids and just has empty sockets, so I turned my torch on to check, as it was dark and I saw that's she doesn't." They tried to recreate the picture but couldn't. They even tried it with someone else but could not. Janet the doll has been owned by Julie and it was given to her by her grandmother in 1903. She approached an investigator on Twitter to take it away when the doll came under supervision. People reported haunted experiences and stopped coming to the house when the doll was on display. The recent incident has only raised the creep factor in this doll.